So, I decided to share a little sketch from the past. It does show an M word after all, Music (a word that my daughter loves). We are as I am writing this listening to My home is nowhere without you by Herman Düne (I am liking you to the youtube video). 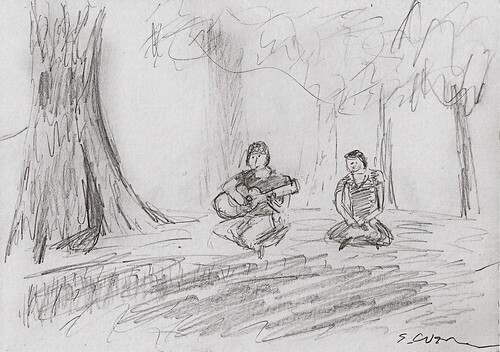 The drawing blow was a sketch I did in the summer of 2009, listening to the two people making music under a tree in the Parc Monceau, one played the guitar, the other sang. Moody Michael mixes melodies in Manhattan. I think this post shows music is in your very soul. I had the same problem with M – too m’s 🙂 great sketch, Solveig! Love the sketch, Solveig. The Parc Monceau is such a lovely place to be and play Music, a great choice for the letter du jour. Best to you. Some days are just “Mmm Days.” I like the sketch and all the M words, too. I’m sure any of them would have been fine. But I like this one, too! It is tough coming up with new ideas. I’m burning out. Are you surviving OK? Ohh I’m glad I clicked through, that is one very pretty sketch. And the Mmm kind of embodies your difficulty in choosing. So quite relevant I’d say.